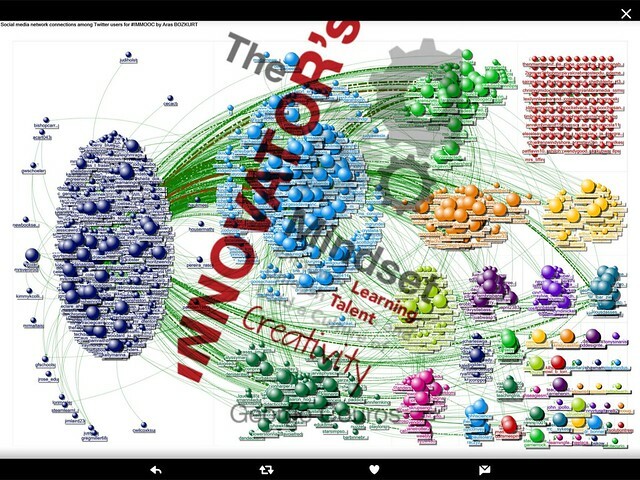 I did a little #IMMOOC (Innovator’s Mindset MOOC) blog tour the other day, mostly through links shared via Twitter, since there are just too many blogs to get settled into my RSS feed. I spent part of my morning, just following links and reading and leaving comments, and grabbing ideas. My aim was to be inspired by some of the writing and to think more deeply about what fellow IMMOOCers were sharing. I took what I thought was a central piece of their blog posts and layered it a visual (via Pablo site). You can click on the images to go to the original blog post. I encourage you to do that. Leave them a comment. Interact. Engage. Push back. Angela’s observation about the power of curiosity hits home with me, and I am always wondering if I do enough to set the grounds for student-led curiosity, as opposed to teacher-led instruction. Finding the middle ground there seems to be a key. And remaining curious as a teacher? Critical. 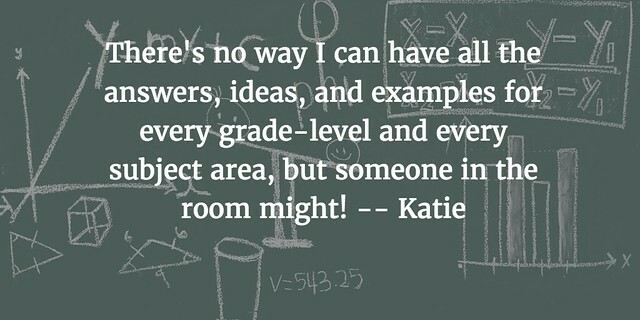 Katie reminds us that if we see ourselves, teachers, as experts on everything, we’ve got the wrong thinking going on. Sure, we probably do know a lot about a lot of things, and our students expect that. But our students, and outside resources, can be valuable, too. Turning to students for insights and help and ideas is empowering for them. But it takes a certain confidence for a teacher to be able to do this. Her central question, coming from her role as a professional development facilitator, always lingers in my head before, during and after facilitating professional development: Would I want to be a participant in my own professional development sessions? And the other: Would I want to be a student in my own classroom? — that’s just as critical. 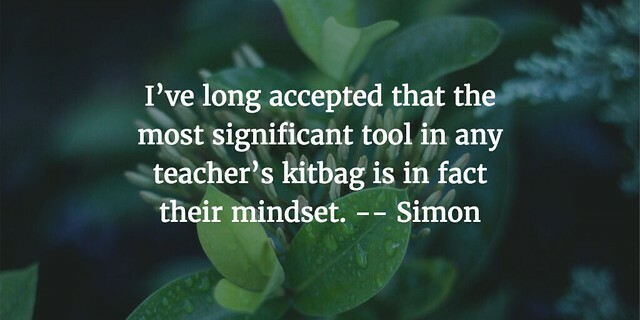 Simon brings up mindset theory – as George does right in the title of the book underlying this MOOC experience. I am still struggling with the concept of “mindset.” I understand the underlying elements (and just read a whole piece in Time Magazine about mindset learning in schools, which helped) but I get caught up in how jargon-y it all sounds. Is it too squishy for me? I’m not sure. I need to keep an open mind here. Change my mindset? Maybe. 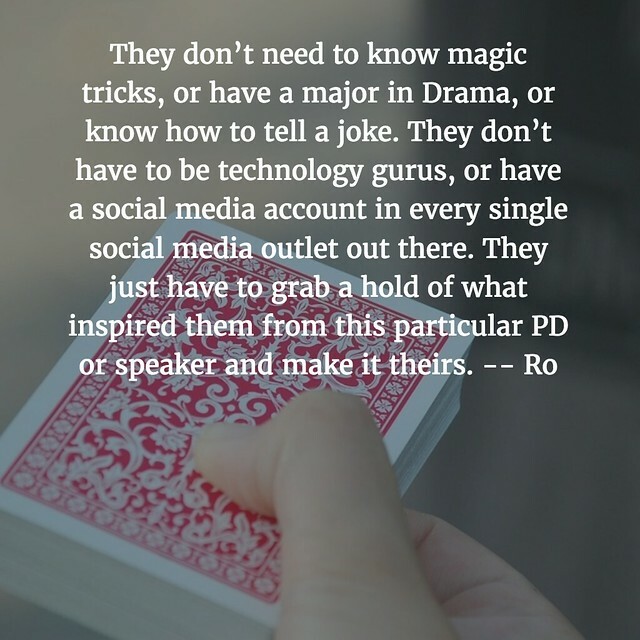 Ro’s sense of possibilities from professional sharing rang true with me. It’s both the idea of “walk away with something for tomorrow” and/or “that may need to simmer a year or two” — both take-aways prove the mettle of a PD session. If I don’t have either of those in my head, the PD was a dud. If I have both? Success. Melissa’s point about collaboration and how that skill is crucial to the world beyond school is spot on. It’s not on the test — but collaboration with others, of different backgrounds and different skill sets and different ideas, is the foundation for life. Where else can we best introduce and model is but in our classroom? 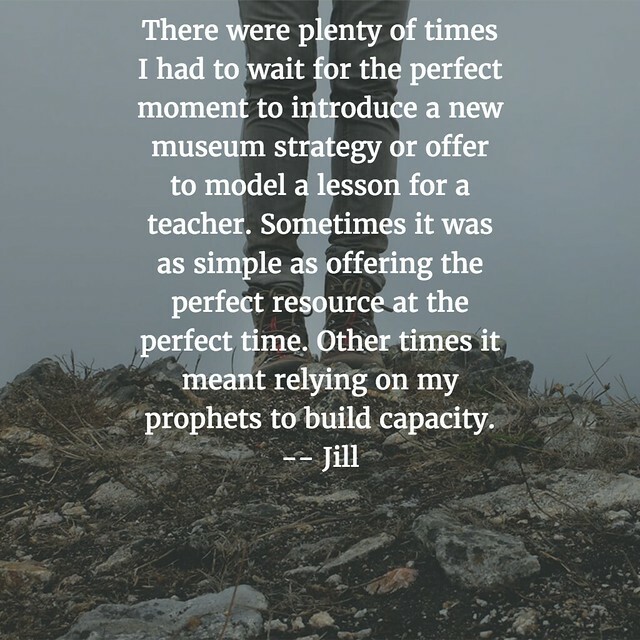 Jill’s insights about “right time/right moment” resonates with me, although I worry about missing that time and moment. I wish there were more times when everything clicked and it all came together in perfect symmetry — my teaching skills and my student’s learning needs. It does happen. That’s the magic of teaching. 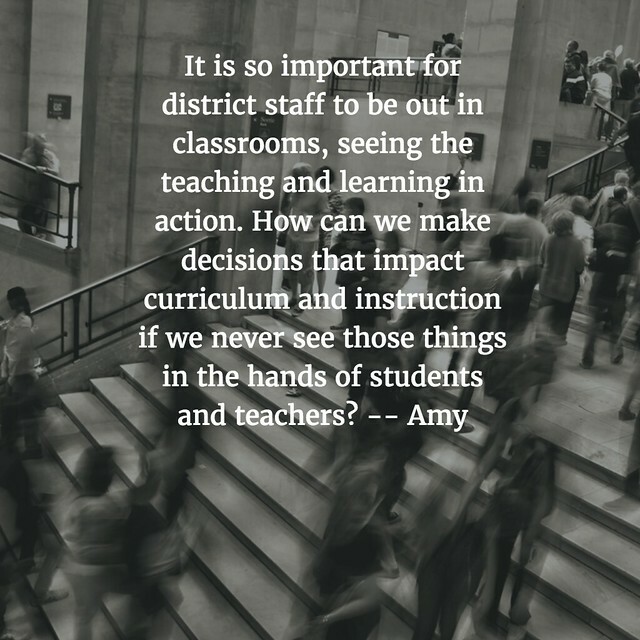 Amy brought me insight into the administrator’s view. Which is good. The most powerful takeaway from the IMOOOC for me so far is the interaction with school principals, superintendents and other administrators who are working to make a difference in their schools. Learning about their learning, and their dramatic and modest attempts at change, is helpful for me, a classroom teacher. 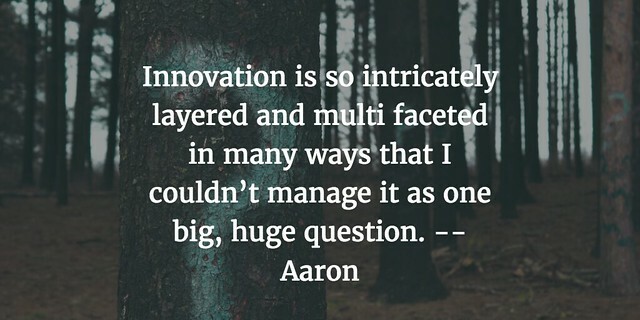 Aaron reminds us that seeing the big picture, as well as the smaller pictures that make up that big picture, is a critical move for any leader of a school. Change can feel overwhelming, and speaking as a classroom teacher, if it is clear that an administrator is overwhelmed, we teachers go: Uh Oh. Thank you to all the bloggers, writing and sharing. I appreciate it. Ha! You beat me to it! I was reading blogs and collecting phrases about what resonated with me and that journey led me here! 🙂 Great minds and all that. You certainly fleshed out the process more thoroughly and creatively than I did. 🙂 I like the quotes as images.